There are several types of animals you can raise, both as household pets and livestock. Some you have to order from town or buy from Van, while others you get only through special events. Dog: At the beginning of the game, you get to choose from two different dogs: a floppy-eared one and one with pointy ears. Be sure to put food in the dish by your house every day! Your dog will like you a lot more if you do. Anything edible you put into his bowl will turn into food, including herbs you find around your farm. When it rains, you don't have to bring your dog into the house (in fact, you can't) so don't worry about it in bad weather. Your dog will be fine. The only dog you will ever receive is the one at the beginning of the game. Carter will never give you a Chihuahua as a pet. Cat: If you're good friends with Romana, she may stop by one day in Fall with a cat. This can happen any fall after or during the 1st year of chapter 2. Cows: You start out with one Normal cow, who will give milk until near the end of chapter 1. Other cows you have to pay for, and you must also pay to have a cow seeded. A heifer will not give milk until she has a calf, and will only give milk for about a year after the calf's birth. Then the cow will have to be seeded again. However, if you have a heifer mate with one of the bulls on your own farm, then it wll cost nothing to have it seeded. A baby cow takes 10 days to mature into a medium cow. A medium cow takes 20 days to mature into an adult cow. Keep all your cows outside when it's sunny. When the weather turns bad, bring them back in. Be sure to feed the cows twice a day when they're in the barn. Calves: Calves (and their mothers) require special treatment. A pregnancy will last 30 days and the mother cow must be kept separate during the last 5 days of her pregnancy, and will be kept in the barn. Since she can't leave the barn, be sure to feed her every day! Once the calf is born, it will be kept in a special "calf hatch" built by the Harvest Sprites at the edge of the pasture. The mother cow will give special milk, Mama's milk, for a few days after she gives birth, so give the calf the special milk twice a day. After a while, the mother cow will stop giving Mama's milk, so the calf will have to drink regular milk instead. After a few more days, the calf will stop taking milk and will only eat fodder. Once this happens, it will soon be ready to leave the calf hatch and join the other animals! Milking: As stated before, cows can be milked for four seasons after they've given birth. The kind of milk will be different depending on what kind of cow is giving the milk. The grade of the milk depends on how well you take care of your cows. Once you purchase the Milk Processing room, not only will cows milk themselves, but you can make cheese and butter. In regards to butter, Regular Butter costs 225G while Good Butter costs 300G. The quality of the butter depends on the type and quality of milk. Chickens: Chickens are kept in the chicken coop, and the females lay eggs (duh.) If you want to incubate eggs, you must have both a hen and a rooster, and the hen has to lay a fertilized egg. Only the fertilized eggs can be incubated. Chickens cost 900G, and you can sell them for 450G. Chickens must be fed fodder you order from town, but they don't need to be fed every day. Just when the food box is empty. Eggs sell for 40G each, fertilized eggs sell for 50G, and gold eggs sell for 300G. Taking good care of any chicken may result in it laying a golden egg. Sheep: They are kept in the barn along with the cows, goats, and horse. They need to be sheared about once a season, so be sure you have a pair of shears! The quality of the wool will be different depending on how much your sheep likes you. Regular wool can be sold to Van for 75G and gold wool can be sold for 600G. A sheep costs 1500G. Horse: Takakura comes one day in Summer or Fall of year one and brings you a horse - for free! You can ride the horse around the village, which will drastically reduce the time it takes to get places. When it's in the barn, be sure to feed your horse. You cannot sell it. 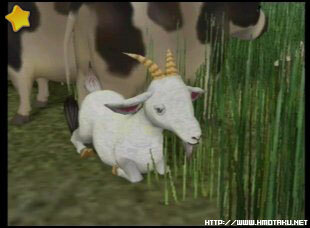 Goat: Starting in the first year of chapter 2, Van will sell goats during Spring. Goats produce milk, and will give milk for about one year. Goat milk sells for 120G, while good goat milk sells for 300G. They are kept in the barn along with your other animals. A goat costs 4000G. Ducks: First off, you need to have a pond built during chapter 1, and must be raising less than 6 chickens. One day, during Summer, your wife may wake up before you and tell you that ducks came to the pond! You can choose whether to keep them or not. Eventually, some of the eggs that you put into the incubator may start hatching as ducks instead of chickens! A duck can be sold for 500G.